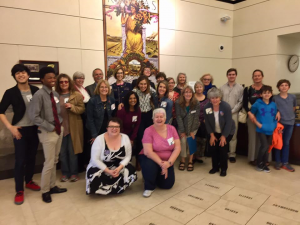 On May 2nd, Voices for Choice, an event organized by PPGP, Trust Women/TW South Wind Women’s Center, MainStream coalition, Kansas ACLU, True Blue Women, and the National Council of Jewish Women was well attended by pro-choice advocates and activists from across the state, ready to lobby against HB 2319/SB 98, otherwise known as “the font bill”. For the awards ceremony, The Next Generation Award went to Nigel Morton, former FOCUS President at WSU, The Outstanding Ally in Government Award went to Senator Oletha Faust-Goudeau, Ranking Minority on the Senate Federal and State Affairs committee, and the Dr. George Tiller Courage Award went to Pedro Irigonegaray, civil rights attorney. In total, there were over 60 attendees!